Brexit: Will flights be disrupted? At the moment, the UK's right to fly, not just to the rest of the European Union but to 17 other countries it has deals with, is governed by EU law. Could planes be left grounded if the country leaves the EU without a deal? Countries have sovereignty over their own airspace, so international air travel relies on a series of agreements under which one state gives another consent to enter and land planes in its territory. If the UK left without a deal, that would end. UK carriers' EU operating licences would become invalid and the legal basis for air travel between the UK and other member states would disappear. But it's not in anyone's interest to allow air travel to cease altogether. The EU has agreed measures to allow "basic connectivity" for a year, to prevent planes being grounded the day after a no-deal Brexit. UK Aviation Minister Baroness Sugg has confirmed that this will be reciprocated. This doesn't provide the exact same access as before, though. It allows for "point-to-point" trips - from the UK to another EU country and vice versa. But it doesn't cover onward flights to other European countries - or flights by EU carriers between two UK cities. Brexit and holidays: What do I need to know? To continue offering routes between two EU countries, after a no-deal Brexit, UK airlines would have to change their ownership structure. They would need to be majority owned and controlled by nationals of EU member states. So, for example, Spanish flag-carrier Iberia - which is currently British-owned - wouldn't be able to fly between two Spanish cities. But airlines are now starting to make those necessary adjustments to meet EU majority ownership rules. The International Airline Group, which owns Iberia as well as Aer Lingus and British Airways, said its flights would operate as normal, although it has not said how it would ensure this. A representative said: "We are confident that we will comply with the EU and the UK ownership and control rules, post-Brexit." Meanwhile, Easyjet, which flies between EU countries - not just from the UK to another member state - has responded by setting up a new company in Austria. 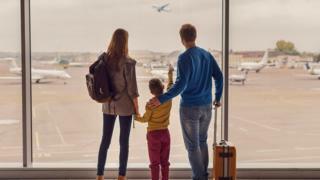 Sinead Conroy, an aviation consultant and former Ryanair manager, said it was "highly unlikely" passengers would see disruption straight after a no-deal Brexit. "Aircraft are not going to get stranded, passengers are not going to get stranded," she said, adding that mass cancellations were not expected. Meanwhile, another industry source said that while passengers were unlikely to have problems flying the day after a no-deal Brexit, there could be issues with freight. Express freight companies such as FedEx and DHL often rely on flying from the UK and onward, from one EU country to another rather than the point-to-point journeys most passenger aircraft take. A Department for Transport official said the EU legislation "gives UK airlines the rights to fly to the EU, which will be reciprocated by the UK". "This should allow businesses and passengers to continue to book and travel with confidence," they said. Although the regulation did not allow UK airlines to fly either cargo or passengers from one remaining EU country to another, the department was in close contact with UK industry and "we understand that they are putting in place actions to mitigate the impact", they added.